If you enjoy sushi/maki rolls but haven't ventured to make your own, I hope this pictorial encourages you to give it a try. 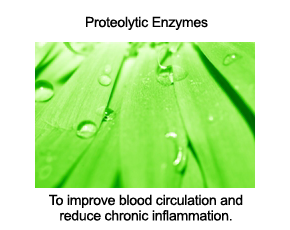 It's a lot easier than you might imagine, and the cost is minimal compared to buying sushi at a store or restaurant. 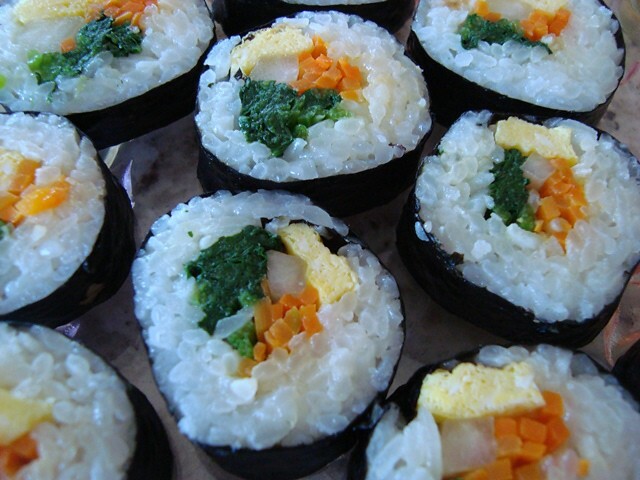 Called kim bap in Korea, sushi/maki comes in countless varieties. 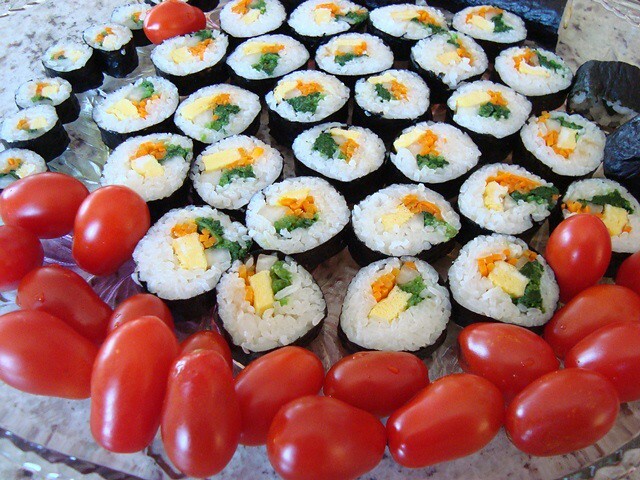 Once you learn how to make a basic sushi roll, it's a snap to churn out all sorts to suit varying tastes and setttings. 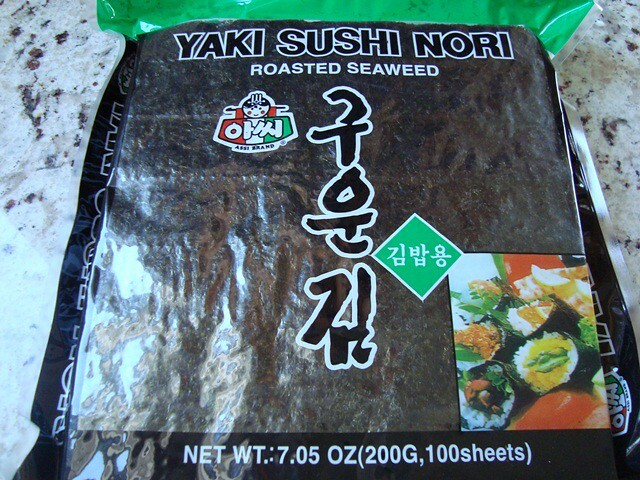 You'll also need sheets of roasted seaweed, which are readily available at Korean and other Asian grocery stores. 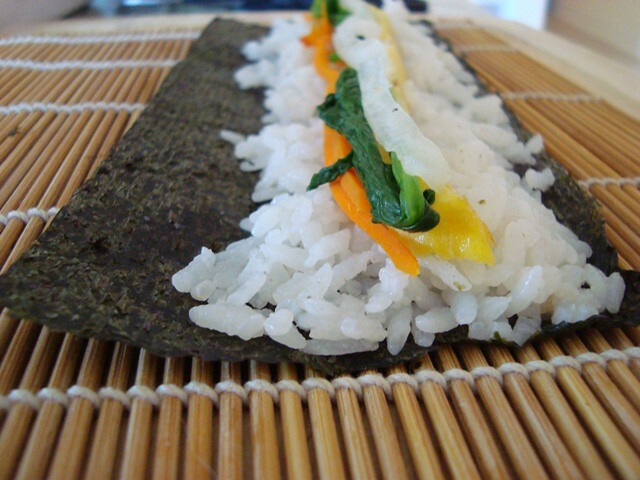 You're looking for unsalted, roasted nori seaweed. If you go searching for this at your local Korean market, you can ask for "kim that's used to make kim bap." Kim means seaweed, and bap means rice. The "k" in kim sounds like "ghee." 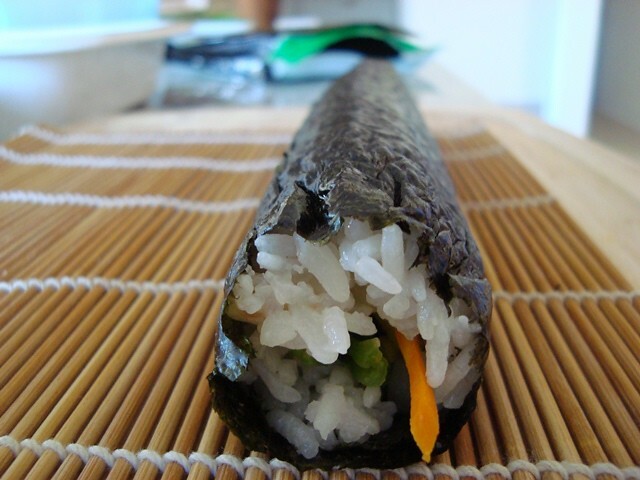 To make a basic vegetable sushi roll, start by converting a couple of carrots into thin strips. 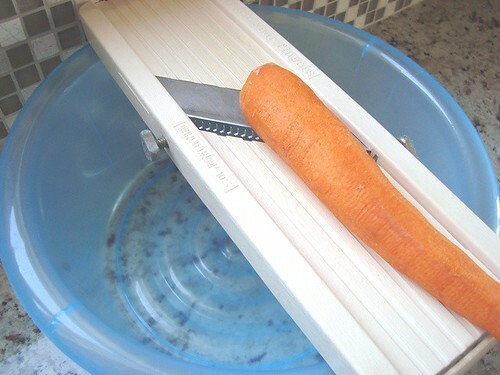 We do this using an inexpensive mandoline, which we place over a basin and hold firmly against a solid surface to keep things stable as we julienne our carrots. Use a little extra-virgin olive oil and sea salt to saute your carrots, then set them aside until you're ready to start rolling your sushi. 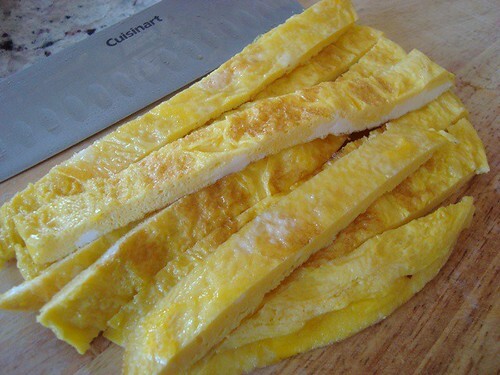 Use your best knife to slice your fried egg into long strips. One ingredient that Koreans rarely leave out when making sushi is pickled radish. Old school Koreans called this "dak kwang," which I understand comes from the Japanese term for pickled radish. If you look for pickled radish at a Korean grocery store, you can ask for "dahn moo jee." These days, most packages of dahn moo jee are labeled in english as pickled radish, and you'll likely have a choice between white and yellow varieties, as well as different shapes. For convenience, you'll want to select one that comes in long strips, if possible. 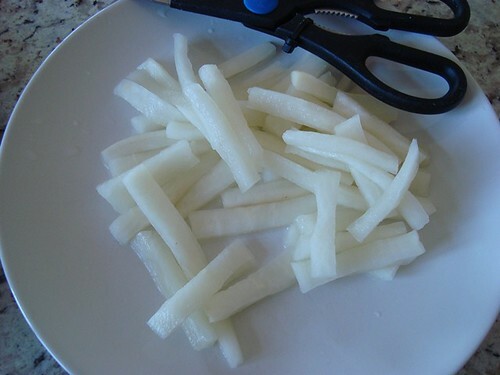 If long strips of pickled radish aren't available, you can get whatever is there and cut them yourself. We typically use homemade pickled radish, courtesy of my mom. It's always nice to have something green in your sushi rolls, for the vibrant color and also for the chlorophyll, calcium, and other nutrients found in dark green vegetables. Spinach is a common choice, and if you want to prepare it like most Koreans do, have a look at Margaret's pictorial on how to make bi bim bap. Wash and steam spinach until it's cooked but still retains its dark green color. Transfer cooked spinach to a basin of cold water (with a few ice cubes, if necessary) to ensure that cooking stops and spinach remains a rich, dark green color. Use your hands to squeeze excess water out of the spinach. The drier you can get your spinach, the better. Season with a touch of sesame oil and sea salt. Once you have your vegetables ready, line them up so they're easy to pick up one after the other as you make your sushi rolls. Please keep in mind that you can use any other ingredients that you desire. We often include avocados and asparagus, though we didn't have any around the day we made this batch of sushi. You can prepare asparagus the same way that you would prepare spinach. With avocados or anything else that doesn't come in long strips, simply slice them so they're about the same width as the rest of your sushi ingredients. Time to prepare the rice. 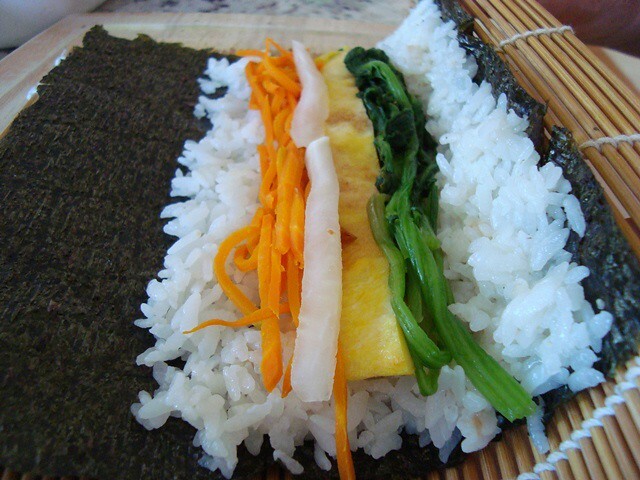 It's best to use sushi rice, which is typically called "calrose" rice. 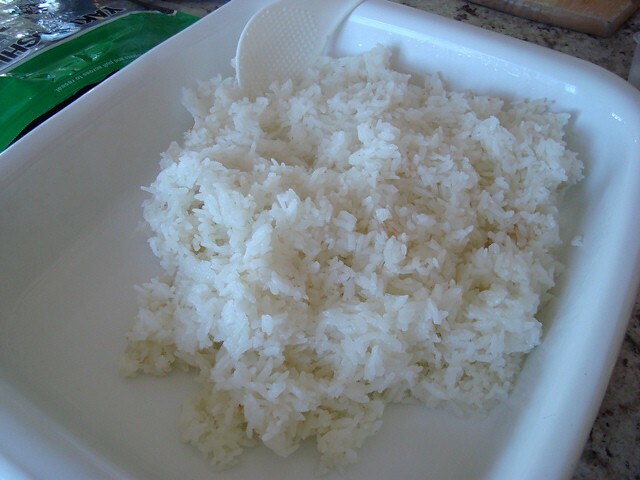 Put about three cups of cooked sushi rice in a large casserole dish or mixing bowl. Add a full tablespoon of sesame oil, a couple of pinches of sea salt, and mix well. 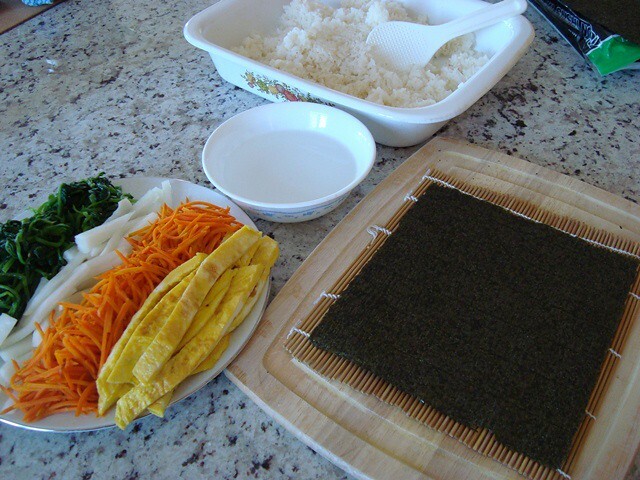 To minimize mess, we like to place our sushi rolling mat on a cutting board before we do any rolling. 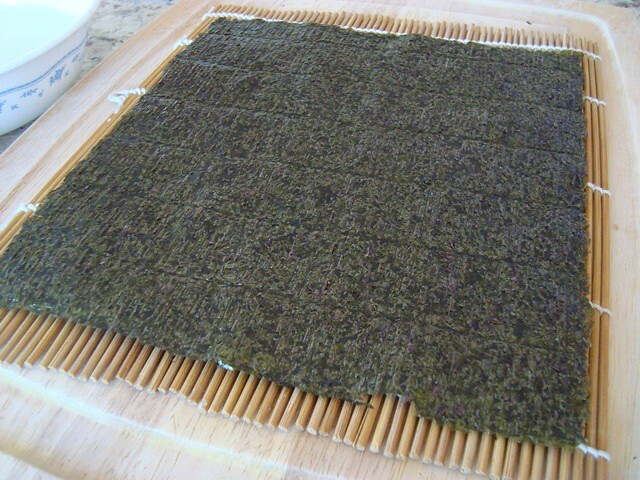 Center a sheet of seaweed on your rolling mat. 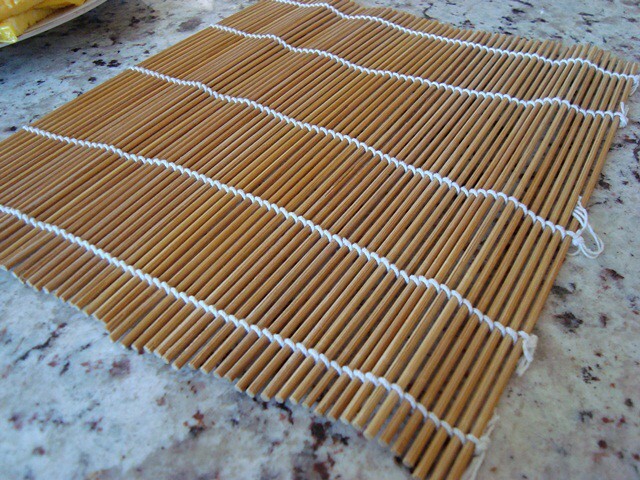 By the way, if you don't have a rolling mat, you can always use a sheet of saran wrap instead, though a bamboo mat definitely makes for an easier job of sushi rolling. Along with your seaweed sheet, rice, and vegetables, have ready a small bowl of water. Please note that this is no easy task. 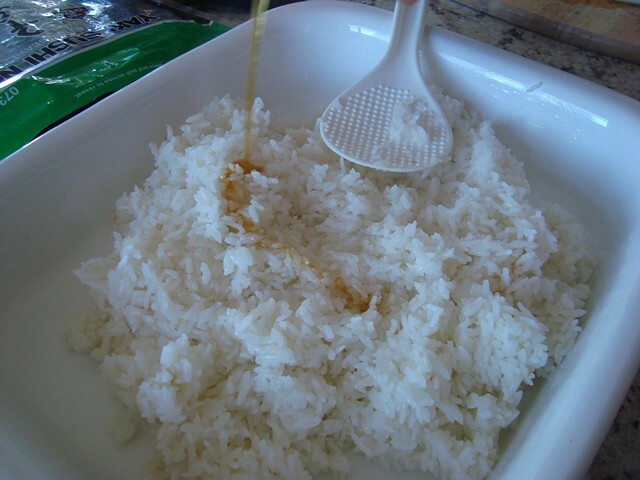 The rice is naturally sticky, and though the water on your fingers will help you spread the rice out, go into this step knowing that even those who roll sushi for a living acknowledge that this can be a frustrating task. For comfort, keep in mind that it doesn't really matter if things don't look great at this point, as once your sushi is rolled up and cut into bite-size rounds, it'll all look beautiful. Now layer your vegetables on top of the rice. 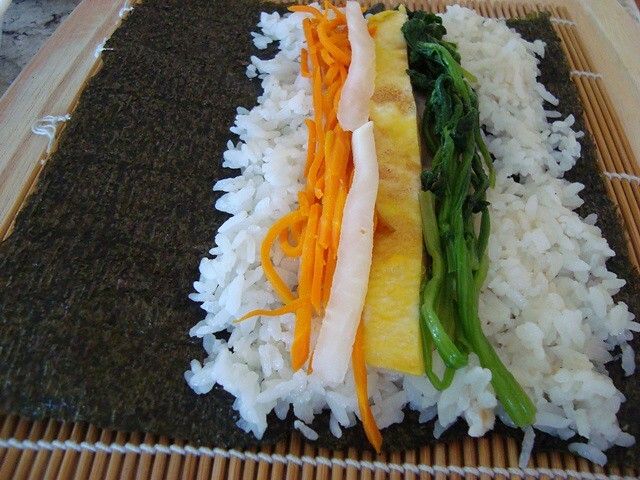 Please note the amount of seaweed space that remains to the right and left of the rice and vegetables - this is necessary space for proper rolling, so be sure not to use more rice than what you see here. Slowly and gently lift up the side of the bamboo mat that's closest to you, the side where the rice comes up close to the edge of the seaweed sheet. And roll all the way over so that under the bamboo mat, there lies a fully draped roll of sushi - covered with one layer of seaweed, I mean. 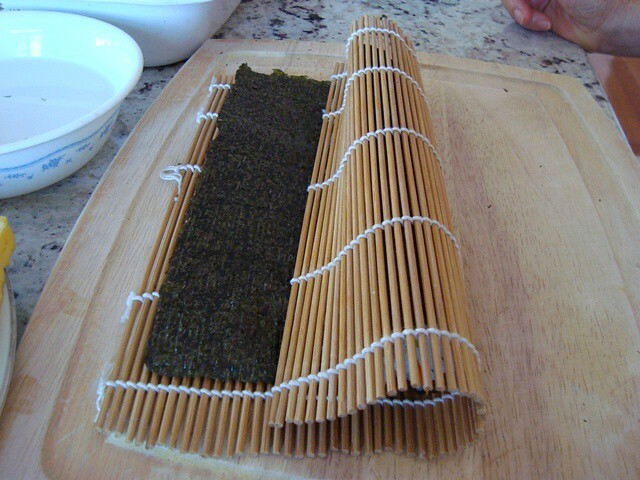 Use your hands to firmly shape the sushi roll that's taking form within the bamboo mat - you want to somewhat knead/massage the bamboo roll to coax the seaweed, vegetables, and rice within to become the cyclindrical roll that it's meant to be. 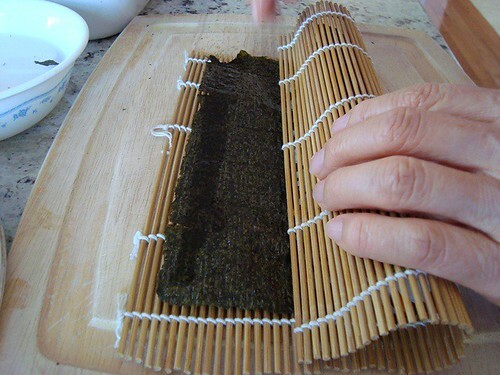 Now use a fingertip to gently slide a line of water at the far end of your sheet of seaweed - this water will serve as the glue that will keep your sushi roll intact. 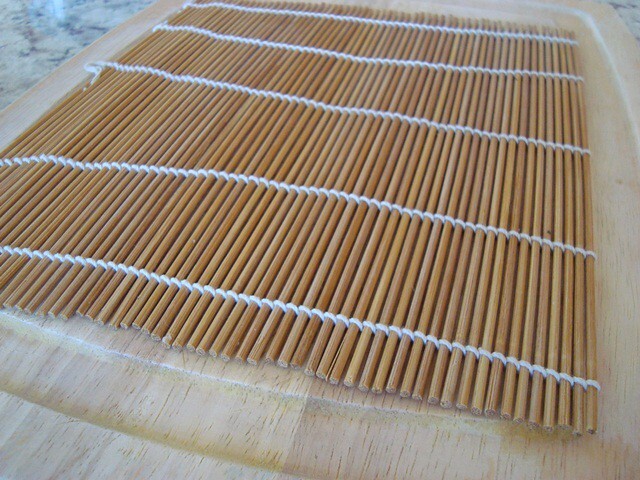 Now unroll the mat, use your hands to roll the partially finished sushi roll over until it's fully wrapped and sealed with the thin film of water, then roll one more time with your bamboo mat and gently knead again to encourage it to keep form. 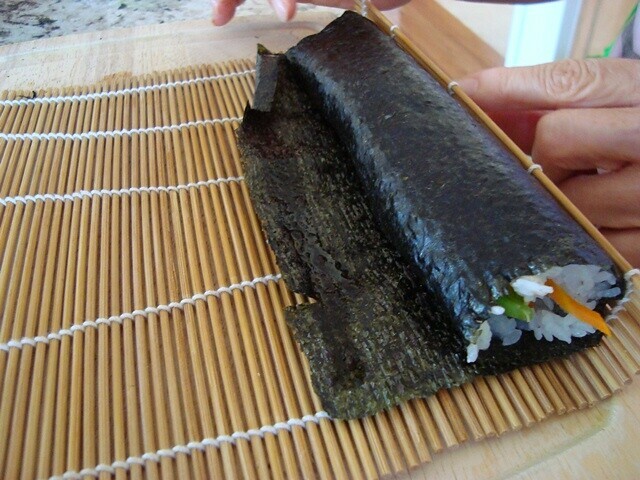 As an aside, if you have little ones who you want to make smaller bite-size sushi pieces for, start with half a sheet of seaweed and use half of all of the ingredients that go inside. It's a bit harder to roll these miniature creations, but the little ones love them. Keep in mind that you can use whatever you wish in place or along with the vegetables that are shown here. Some folks like putting in a generous strip of kim chi. Others use tuna or salmon salad (tuna or salmon, celery bits, and mayonnaise) as the primary filling. Strips of marinated chicken, beef, fish - use anything you feel like. It's generally best to make all of your rolls and have them sit as a little gathering of sushi rolls before you serve them up. Before slicing into bite-size rounds, use the pads of your fingers to moisten both sides of your knife. 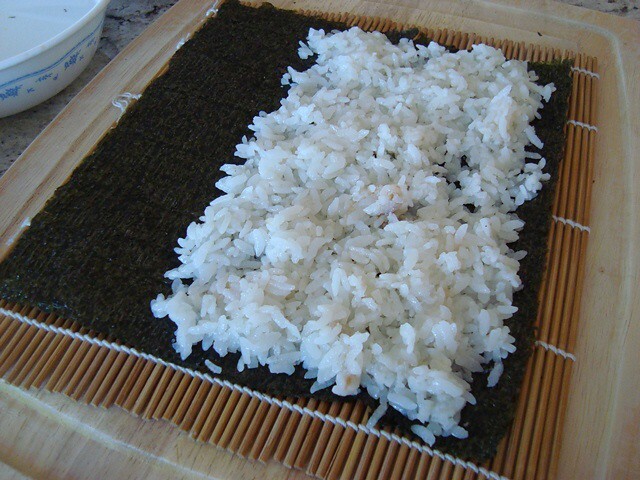 This will help you make clean cuts, where the seaweed and rice don't get too messy and stick to your knife. It's always nice to serve sushi up with some fresh vegetables on the side. Use whatever you have on hand. Keep in mind that you don't have to cut all of your sushi rolls into the same size rounds. You can leave some as miniature logs that can be eaten as wraps. If you're making sushi for a picnic lunch or just for when you're on the go, you can leave them as big rolls and eat them just as you would eat wraps or burritos - just store them in an air-tight container while traveling. If you'd like a dipping sauce, combine soy sauce with just a few drops of sesame oil and vinegar - this is a super simple and mouthwatering sauce that we use for kim bap, dumplings, and Korean pancakes. 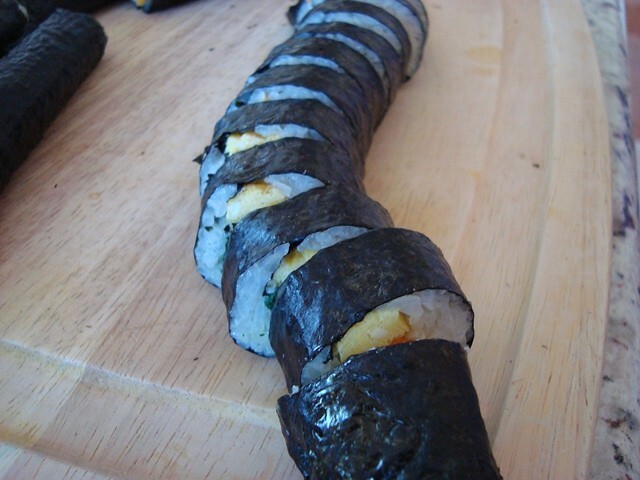 That brings our look at how to make sushi rolls to a close. If you give sushi-making a try and care to share your experience with others, please use the comments section below. Pictures are always welcome. Thank you for this recipe Dr. Kim. I can't wait to try it; it looks so yummy! I always learn something from your postings. Thank you! :D I wonder if brown rice can be used? question; can these be made using soy paper and if so, where do I purchase it? Thanks Ben for your beautiful lesson. I love your site! As a nutritionist in Australia I can see that what is needed more than ever is good food education! What a great way to teach in our busy world! I too am a great fan of Weston A Price, as I know you are. I am a bit of a foodie nut, make my own sour dough breads, keifer, cheeses etc and will try one day to do a pictorial for education purposes. You have inspired me! 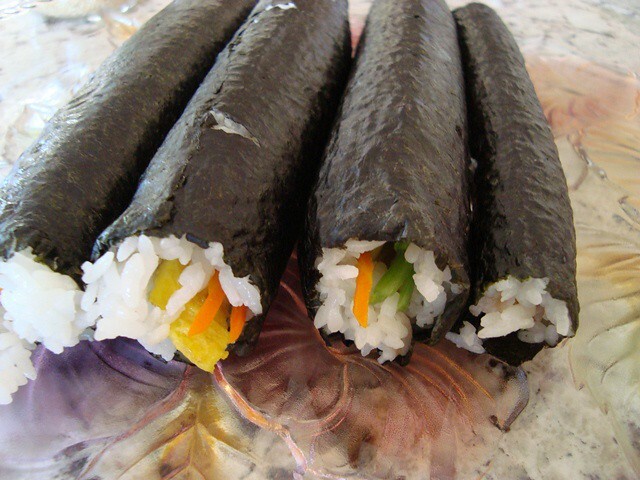 As asian groceries are much more common than Korean ones and the Korean terms are never seen in the asian stores, readers should know the more common Japanese terms, such as nori maki (laver roll), daikon (Asian radish), takuan (pickled asian radish...named after the zen master reputed to have invented it). When you order sushi at your local sushi shop, you will not be getting the recipe above...the rice will have only rice vinegar, sugar and salt added. Ben says to add sesame oil, but it looks like he is adding toasted sesame oil, a quite different item. I use the traditional Japanese recipe with unrefined rice vinegar (never distilled), subbing honey for the sugar, and an unrefined salt. And for those aware of the inadvisability of using refined carbs, know that pressure cooked short grain brown rice works fine for me. I sometimes put pickled ginger (look for undyed), umeboshi (salt plum), or any colorful vegetable like string beans inside my maki. I prefer to steam my julienned carrots, buy the nori raw (black) and fresh toast it myself until it is bright green. 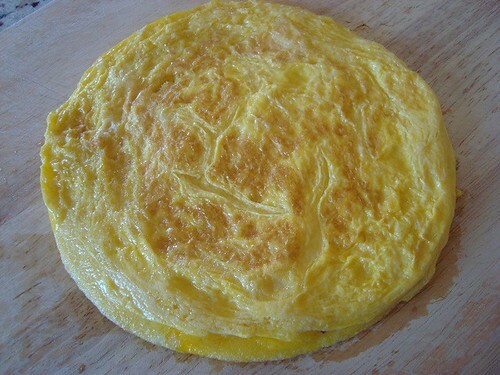 This can be done in an oven, over a gas burner or even over an electric burner. And last, but not least, don't forget the frosting on this cake: wasabi! This sinus-clearing condiment can be found in pure, undyed powder form (avoid the many adulterated imitations...just add water. Thanks for the detailed steps especially the pictures on how to make sushi. My 9 yo son has been bugging me to make sushi for the longest time (he loves sushi), but I have not tried to do so because of the many, many ingredients that I would have to buy to get started. After reading your post today, it has given me "courage" to get started, especially now that I know I don't really need all the typical sushi ingredients on hand before making sushi ! I agree with nadaman that short grain brown rice (genmai)can/should be used for increased nutrition. I much prefer the Korean method of using toasted sesame oil with the rice and no sugar and intend to try it. I love the idea of leaving it in a roll to eat away from home. I also agree that wasabi is imperative. I was recently introduced to a Japanese/organic market (in Windsor) where I purchased wasabi powder that includes spirolina to add the green colour. Isn't that clever! Great selection of ingredients! I love all of them. Cucumbers and carrots are so yesterday. 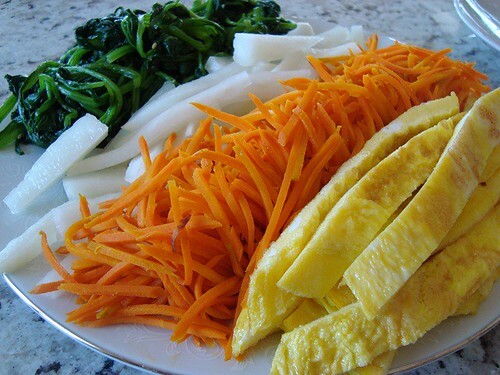 Thank you Dr. Kim for this amazing recipe, it's delicious and healthy too! The pictures are great, they make my mouth water! :-)Please tell your mom THANK YOU!! she is awesome. You are the best! Wishing you all the best in your further work :)! I can attest to using brown rice for "regular" sushi making, but no doubt, the white rice for the "inverted" roll (rice on the outside) seems so much more workable. Also, nobody including Dr. Ben has mentioned what side up should the nori be positioned on the mat. I generally have the shiny side (yes, there is a shiny side) lying down and the dull side looking up. We mix cauliflower rice to reduce the carb content and add some salt and toasted sesame seeds to the rice mixture. 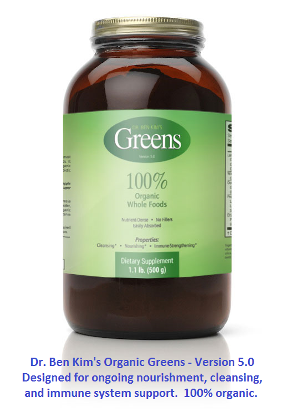 It is so yummy and healthy even my child loves it and takes as a packed lunch to school. Hi Dr. Kim! and All! These are GREAT! I haven't tried to make this in 20 years, but your article got me going again. Some dear friends came over a couple of weeks ago with the SAME idea and brought all the fixings, and what a pleasure it was to make and eat them together. This is a social food. And Pure Joy. As per my friends recently successful tasting recipe. QUESTION, is the Sesame Oil just as tasty and healthier? Also I read that Mirin might be good, but I'm not sure how to use it. It sits in our fridge so sad and lonely. Will try Sesame Oil NEXT. Hoping someone chimes in on Mirin uses. Guilt Admission: I was feeling so low down that I actually bought and included Imitation Crab--I know I know! Badness. But it had the salt and whatever that made the rolls comforting tonight. My husband liked them as well. I LOVE raw fish, I'm just afraid to risk that in Tucson, Arizona right now. Any advice on how to choose a really safe place for raw sushi? Sashimi, Nigiri? Our fillings tonight were English Cucumber, slightly steamed carrot sticks, avocado slices, and imitation crab. My rolls turned out kind of big, perhaps I used too much rice? Appreciate ANY advice from you all! 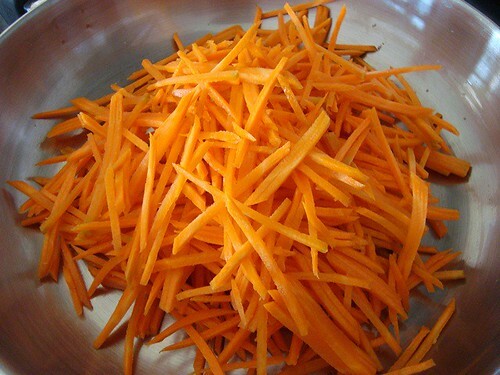 Softening the carrots was so much better than raw carrots! Any suggestions welcome. Thanks for kicking my dinners into gear and reminding me of the incredible joy that comes from making these, and actually interacting with our food. The body actually cares about fresh food and preparation--sigh, I had forgotten that. What is particularly joyful about this dish is that it's so much happiness when prepared with friends or family. It's a very interactive joy space for food.